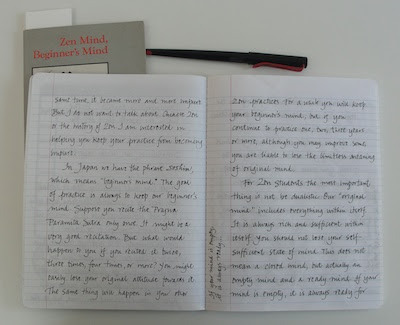 I'd been thinking about rereading Zen Mind, Beginner's Mind by Shunryu Suzuki for a while. 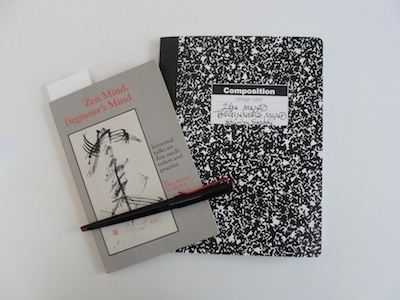 I was first introduced to it in a weeklong class with Jaki Svaren, author of Written Letters, at the Innovations Calligraphy Conference in Philadelphia in 1982. It was a a new way of thinking that had a major impact on me. As with so many things, parts of the book became part of me but much was forgotten. I knew it was a slow read and thought about where to fit it in my reading schedule. I decided to take it very slowly and read and copy out a paragraph a day. I'm copying it into a simple marbled school notebook. I didn't want to use anything that would make me feel precious or pressured about the writing. Your opening quote, about the beginner's and expert's minds, affirms what i have found: the more i know, the less i know. Perhaps you are speaking to a different phase of creation, but i find more possibilities as i learn more about the world and art. 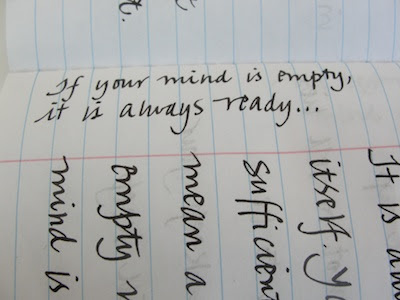 I suspect that's because you are able to keep your beginner's mind!